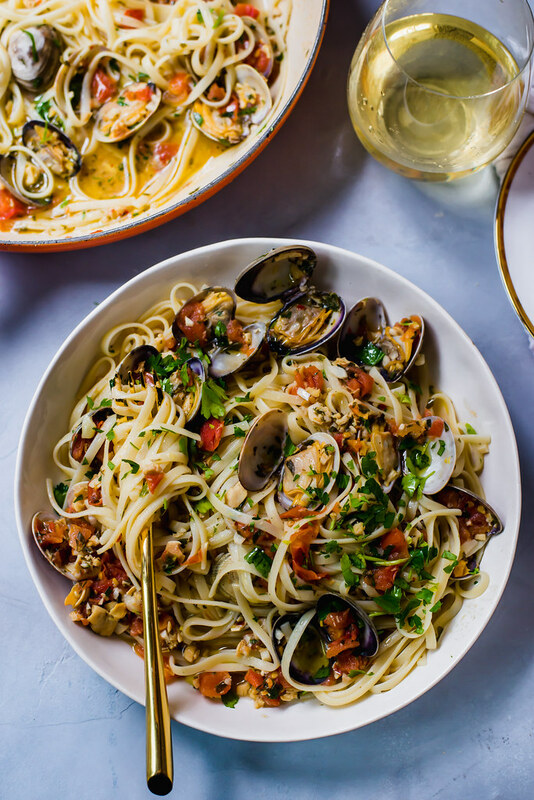 A classic to say the least, linguini and clams is my ultimate go-to mid-week dinner. Clams cook up quickly and the sauce can be thrown together in a matter of minutes with pantry staples. I love making Spanish style steamed clams with fresh herbs or adding them to cioppino, aka my favorite seafood and tomato stew that I can literally polish off an entire loaf of ciabatta on. Now there are a lot of linguini and clams recipe, but this is the way Joe and I make it at home and for the last 10 years. Personally, I don’t prefer a totally white clam sauce because I find it overly buttery and one dimensional. But with the addition of sweet tomatoes that gently burst in the sauce, it counters the richness of the butter just perfectly. My secret ingredients is..and don’t run away now…canned clams! They are perfect because you get so much clam meat that you don’t have to dig between clam shells for. Plus it already comes with glorious clam juice that is just so addictive when reduced with white wine. Use it all..every last drop, I tell ya! Also, suggestion. Omit the pasta and make a “steamed” version of this and sop it up with a crusty loaf of Italian bread! Put a large bowl of clams with the made sauce and sop away. Now that is a dinner I can do any day of the week. In a large skillet over medium heat, drizzle olive oil and add butter, chopped garlic and red pepper flakes. Saute until garlic is lightly golden, about 2 minutes. Next pour in the wine wine and canned clams with their juices and reduce for about a minute. Add in the chopped tomatoes and toss everything together. Then add the cleaned fresh clams, lemon zest and juice and toss everything together again. Cover with a lid and cook until the clams have opened up, about 3-5 minutes. Discard any clams that have not opened. Once done, turn off the heat and garnish with chopped parsley and season with salt and pepper. Toss with cooked linguini and pour in 1/2 cup of reserved pasta water. Toss everything together and taste for seasoning. If you love clams as much as I do, there is nothing that beats a warm bowl of classic New England clam chowder and these beer steamed clams with chorizo sound insanely delicious, spicy and savory! And once summer rolls around, you bet I’ll be trying out these grilled clams! Yum! I love the addition of tomatoes and the lighter less butter version.